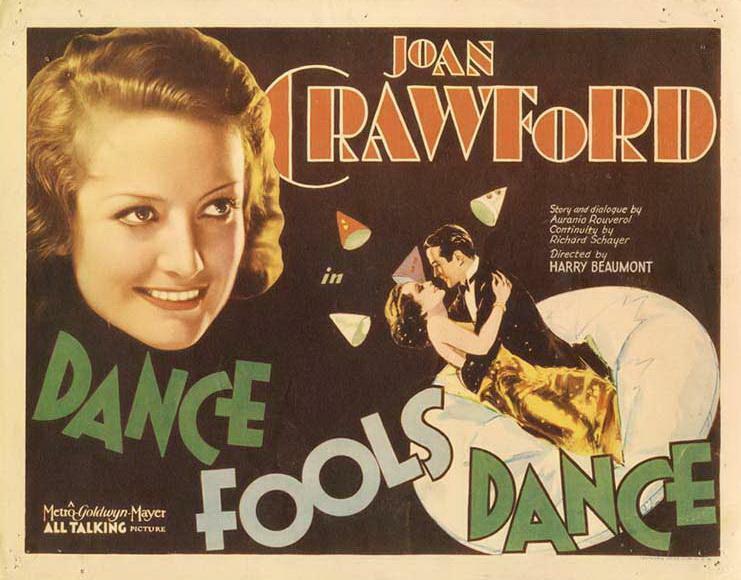 MGM co-starred Joan Crawford and Clark Gable for the first time with their 1931 gangland saga DANCE, FOOLS, DANCE. Well, not exactly co-starring; 27-year-old Joan was already a screen veteran and a star, while 30-year-old newcomer Gable was billed sixth in this, his third picture (not counting his extra work). Regardless of billing, the pair had a definite sexual dynamic between them onscreen (and offscreen as well, if you know your Hollywood history), and the studio would team them again in seven more films. Joan is carefree Chicago socialite Bonnie Jordan, with a twit of a boyfriend (Lester Vail) and a wastrel brother named Roddy (William Bakewell) who’s got a penchant for booze. When the stock market crashes and their Pop croaks on the exchange floor, the kids are left with neither money or marketable skills. Bonnie’s upper-crust boyfriend Bob offers to do the honorable thing and marry her, but that horrified look on her face says it all! Rejecting the twit, Bonnie’s determined to find a “man-sized job” and make it on her own. 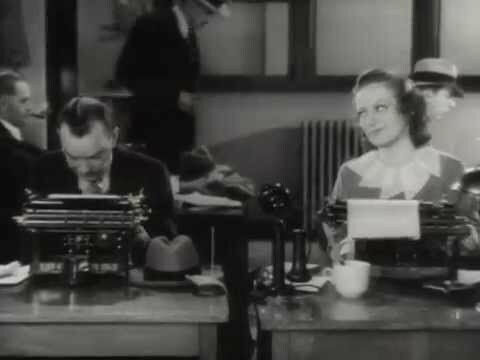 Steadfast Bonnie lands a job as a cub reporter in the male-dominated newspaper racket, where all the wisenheimers crack wise and ogle the pretty new filly’s form (and I love that “clickety-clack” of all the typewriters in the newsroom!) She’s befriended by ace crime reporter Bert Scranton (Cliff “Ukelele Ike” Edwards, the voice of Jiminy Cricket! ), who takes her under his wing. Roddy also gets a job, pushing hooch to his society pals for tough bootlegger Jake Luva (Gable). All eyes will be on Gable when he enters the scene, looking hard as nails and twice as dangerous. 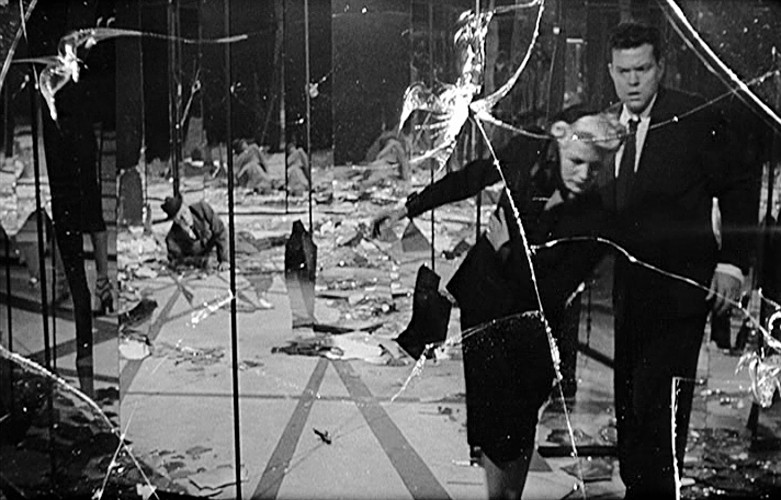 Roddy unwittingly becomes the wheelman in a St. Valentine’s Day-style massacre, with seven rival hoods mowed down by machine gun fire inside a garage. A shaken Roddy heads to the bar in Luva’s nightclub, where his loose lips meet up with Scranton’s ears. Luva ‘s not happy, and orders the lad to kill the nosy reporter or else! Accompanied by a pair of goons, Roddy reluctantly does the deed, then is forced to lay low in one of Luva’s apartments. Bonnie becomes bait to get the goods on the gang, posing as “Mary Smith, a tough girl from Missouri… a cheap moll in the underworld”. She gets a gig as a dancer at the nightclub, which allows Joan to strut her stuff and show off those gorgeous gams in a hotcha cabaret scene. She catches the eye of Luva, who invites her up to his room and tries to put the make on her. Bonnie’s saved by the bell when the phone rings, but when she picks it up she hears Roddy’s voice on the other end. Rushing to his apartment, Bonnie finds out the truth. However, Luva discovers Bonnie’s identity, and he’s about the take the siblings for a long ride when Roddy finally grows a set and guns down the gang boss and his goon, getting killed in the process. Brave Bonnie calls the story in, and she’s about to leave the paper for a new life when that twit Bob shows up and they get back together. The film suffers from some rah-ther stagey performances by the supporting cast, as many early talkies do. 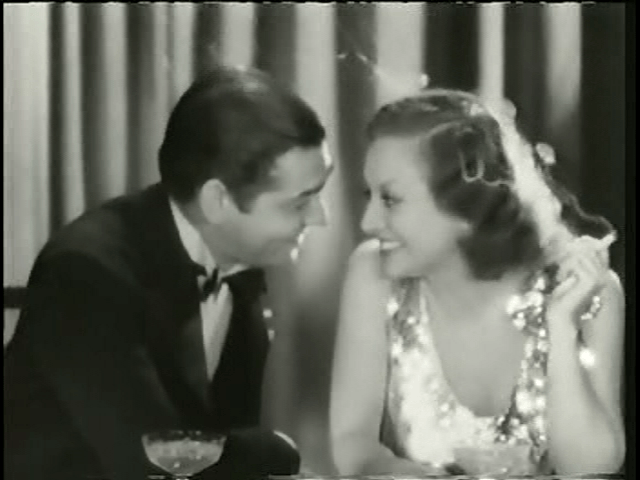 But there’s no denying the sexual tension oozing from Joan’s and Gable’s pores, and their all-too-brief scenes together make this film worthwhile. The Pre-Code-iest scene involves Joan and her young society friends diving into the ocean in their underwear that was risqué for the time, and Joan’s flapper-girl hoofing is pretty steamy. Director Harry Beaumont had worked with Crawford before (OUR DANCING DAUGHTERS), and helmed 1929’s Oscar-winning THE BROADWAY MELODY. Screenwriter Aurania Rouverol delivers some tough dialog, later gaining fame for introducing the world to a much gentler bunch: teenage Andy Hardy and his family in the hit play A FAMILY AFFAIR! DANCE, FOOLS, DANCE isn’t on a par with other early gangster films, but as the first teaming of Crawford and Gable, it’s a movie that should be seen by classic film lovers at least once. I’ve never been much of a Joan Crawford fan but your review has me intrigued to see this one. And I’m a sucker for Clark Gable anyway. I’ll be looking for this one on TCM.